A video of an amazing 5 Star comfort room in a Shell gas station in Bohol had been circulating around various social media. Jason Godfrey took a video of the Shell gas station comfort room and posted it on Facebook which quickly garnered more than 500 thousand views and and more than 11 thousand likes on Facebook two days after it was posted. Many posted comments of their amazement as the comfort room featured in the video is far from the common comfort rooms found in local gas stations. Godfrey shared that he thinks the washroom is far better than many hotel washrooms. As for those curious about the ladies’ comfort room, Godfrey said that it is exactly alike except the absence of a urinal. 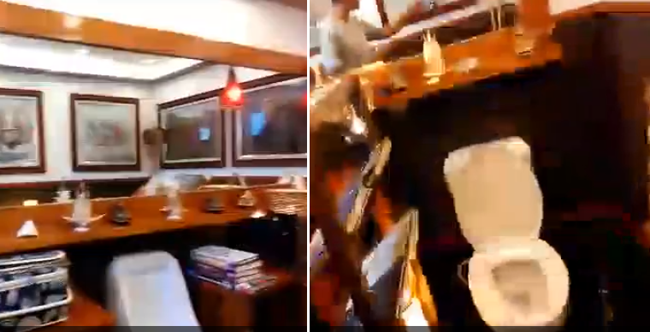 As seen in the video, various paintings are hanging on the walls, there are tissue boxes, and even magazines and pamphlets on racks just beside the toilet. Godfrey said that he does not usually take videos but the washroom amazes him enough to inspire him to record one. The washroom Godfrey shared on his video is found in JM Clarin St., Tagbilaran City, Bohol in Philippines. This is not the lone 5 Star washroom in the city, there is another one found in Amare Shell gas station. Cebu also has one in a Shell gas station in Lawaan Talisay City. Tis viral video has been shared for almost 8000 times in just two days. Many also shared they thoughts that most gas station toilets are not so clean, making them envious of the one Godfrey found in the Philippines. Many others also posted some photos on the comments of other amazing Shell gas station washrooms found all over the country such as one in NLEX. The 5 Star Shell gas station washroom video taken by Jason Godfrey is expected to give some tourists another place to visit in Bohol. Many Facebook users promised to visit the Shell gas station if they ever go to Bohol.